CYFOR provide eDisclosure cost clarity by quantifying the volume of data to be collected as opposed to charging on a per Gigabyte rate. Often, when I meet a solicitor to discuss how CYFOR are assisting law firms with eDiscovery, Corporate Investigations and Digital Forensics, we inevitably get onto the topic of costs. Specifically, the lack of clarity at the initial stages of eDisclosure data processing, which makes clients apprehensive about engaging with a provider early on. During an eDisclosure project, one of the most expensive aspects of hosting data on an online review platform can be costs associated with processing and preparing the data for review. When a collection of ESI (Electronically Stored Information) is made, the amount of data for one custodian will usually total an average of 1.5 Terabytes and this will typically include an image of their laptop, mobile phone, email account and documents stored on the server. CYFOR often collect this amount because we’re imaging all the data for several devices that all contain copies of the same information. As an example, a typical collection would include the imaging of the laptop, mobile phone, email account(s) and documents stored on the server. Once the data has been collected by the Investigations team and it arrives at our facility, the CYFOR eDiscovery team will begin processing of the data. This includes De-NISTing physical devices, (this is where we remove all system files, program files and other non-user created data from physical devices). For emails and documentation, the team will then de-duplicate and perform email threading. This entails the removal of multiple iterations of attachments and allows the emails to be viewed in a more linear path to show where they have been forwarded. When we collect scanned PDF documents saved as pictures containing text, we run OCR (Optical Character Recognition) over the documents which means that words are automatically identified and thus make the document keyword searchable. This approach to processing ensures you’re collecting all data in a forensically sound manner and preparing it for an efficient review. However, if your eDiscovery provider is charging a per Gigabyte rate to process data then this could be a costly exercise and from the outset, there is often very little visibility on how much this might end up costing. Typically, solicitors contact me with an idea of how much data would be collected however, this figure is usually vastly lower than that actual collection made. I’ve met several solicitors who’ve had to provide their client with a much larger invoice than anticipated as an expected total collection of 500GB has ended up being 1.5 Terabytes of data required for processing. How are CYFOR different from other eDisclosure providers? CYFOR believe that it’s unreasonable to expect a solicitor to guess how much data will be collected from their clients, and a back and forth determining the exact figure is a waste of time. That’s why CYFOR will always provide solicitors and their clients with a minimum of 8 hours for the eDiscovery team to prepare the data. On average, 70% of the total time required to process data is the system performing the task set by the project manager, therefore 8 hours of project management time would be sufficient for most matters. 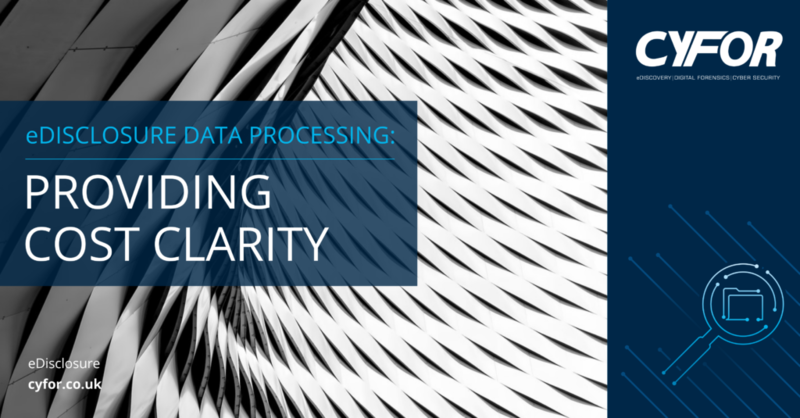 Working in this manner provides maximum clarity for solicitors and their clients as the cost is not impacted by an unexpected increase in the total volume of data.